As a Scandinavian I am raised with hearty breakfasts (the type where multi grain bread is at the base of everything). However, after years of living abroad in the south of Europe, I have adopted the slightly decadent custom of starting the day by seriously boosting my blood sugar levels with a sweeter than sweet treat. On weekends that is. 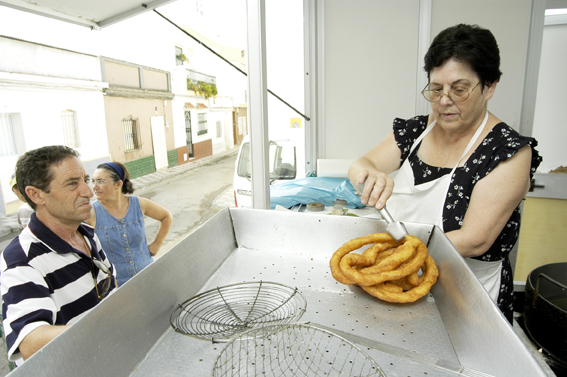 The all Spanish specialty is churros, a version of the doughnut, and a very typical thing to eat at Spanish fairs and festivals. I love the way every little town and village has at least one place that sells churros on weekend mornings. It’s THE place to be. To pick up the local gossip, to discuss politics/bullfights/who was voted out at Dancing with the Stars – and of course to pick up some deep fat fried breakfast for the family at home. The queues are notoriously chaotic, never a straight line of people, but rather a gathering of locals seemingly happy to spend fifteen minutes of their morning socializing. When it’s your turn to order, you ask for the amount of ‘ruedas’ (wheels) you want. One rueda will easily feed two people. The price? Somewhere between 60 – 80 centimos per rueda! More often than not there will be a local bar in close vicinity to the churros kiosque, and you’re always more than welcome to sit down with your churros, order a café con leche and enjoy your breakfast on their premises. Other bars have incorporated their own churrero (man who makes churros) in one corner of the bar. So you simply sit down at a table and order your coffee and churros, and it’s all brought to you. Eating churros is one of those Spanish customs I have come to love. Not simply because they’re soft and crispy at the same time, and because you get to dunk them in hot chocolate (very traditional! ), but also because they add to the laid back, slow mornings when you just know that the rest of the day will follow in the same, wonderful weekend pace. 1. In a heavy based sauce pan, pour 1 cup water. Add oil, salt, sugar and stir. Bring water to a boil and remove saucepan. 2. Pour flour into a mixing bowl, add baking powder and stir. 3. Slowly pour boiling water from saucepan into flour mixture – stirring constantly with a fork until it is a smooth dough without lumps. 4. Spoon dough into a churrera (a large cookie press) or pastry bag. You can also use an empty water bottle if you don’t own the right equipment. 5. Pour vegetable oil into a large heavy bottomed frying pan. There should be enough oil in the pan to cover the churros. Carefully squeeze dough into hot oil while making circular movements with your hand. You’re aiming to make swirls, or ‘wheels’ (ruedas) as the Spanish call them. Fry until golden brown. Remove with a wooden spatula. Place on a paper towel to drain. Once drained, cut into manageable lengths and sprinkle with sugar. (Some also add a tasty pinch of cinnamon to the sprinkle, but this is not the traditional way). This post is part of The Lonely Planet Blogsherpa Travel Carnival about “Food around the World”. It is hosted by Kat Robinson over at http://www.tiedyetravels.com/ where you can read about food in all its glorious shapes, tastes and colours from near and far. Seeing the photo has got me going. And they are even better than a cone of french fries! We are churro fans here in Catalunya! It is a good thing that our local roadside churro stand is only open on the weekends. I noticed that at churro shops here, they slice off the dough as it is falling into the hot oil. So rather than ruedas, you get something more like a stick shape.